(Newser) – Remember the huge stone monument archaeologists found buried two miles from Stonehenge in the UK last year? Well it turns out that the so-called "Superhenge" that radar suggested was made of 100 or so large stones was actually stoneless. "The response from the radar was so good that the team thought they were dealing with a whole series of stones lying on their side" at Durrington Walls, archaeologist Nicola Snashall tells the BBC. But when the team finally got down to excavating two of the pits, they instead found "enormous pits for timber posts." The large beams of wood appear to have been removed not long after they were sunk into the post holes some 4,500 years ago, reports Vice. There you are Elizabeth over here messing with stones, oh Diamonds I get it. How many tell me, it is not too many to steal for an Angel no matter how many, the Lord I am sure will back me up on this, Hey Lord Stratos? The Independent puts numbers to what it calls Britain's "largest ancient monument of its type," reporting that as many as 300 timbers measuring up to 23 feet long were vertically lifted from the holes making up what was a 1,640-foot-diameter circle. After the wood was removed, "the top was then filled in with chalk rubble and then the giant henge bank was raised over the top," Almost none of this makes sense. 1) IF.. there were 300 timbers laid out and READY to drop in the holes, this would make much more sense. 2)The top of what?? 3)What is chalk rubble and what did it look like after the filling?? 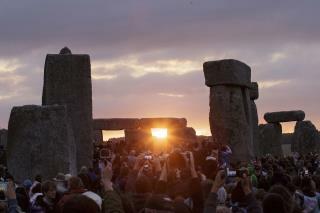 4) 'the giant henge'? Intriguing story but little information of a scientific nature and even less info about the final appearance and where the timbers were laying or why or even how they could have been ALL pulled out of the holes. I think the Independent needs some serious scientific and engineering edits. Sounds like a dam or defensive wall.